How Much Does Rolled Insulation Cost? Rolled insulation is a rather straight forward product. Typically rolled out into attics and other flat surfaces, it is used to cut down energy loss and helps reduce utility bills throughout the course of the year. Roll insulation is installed faster than most other options out there, which also helps reduce worker fees associated with the insulation. However, before you move ahead with the project, understanding what it costs is important, so keep all of these variables in mind. How Much Does It Cost To Install Rolled Insulation? There are a few variables at play when it comes to the overall cost to install rolled insulation. Some of these different price points include: the required square footage the supplies needed cost of labor type of insulation In most cases, rolled insulation is not a difficult DIY project. But, we recommend that you get in touch with contractors in your area to complete this job for you. They have contacts for bulk purchases, they have years of experience, and will complete the job in no time. Begin by comparing as many quotes as possible. Check for references before you have any work done. This will ensure that you get the best value for your money! Required Square Footage When hiring your contractor, ask how they charge for the rolled insulation. Some companies charge by the roll, while others charge by the square foot. Charging by the square foot will likely save you money, as using up a complete roll without requiring slack from another is not likely. On average, a job requires around 540 square feet of rolled insulation. Some contractors may also have a minimum square footage required to do the job. Supplies Required Some contractors include the cost of supplies in with the cost of rolled insulation. Others, however, will categorize this as a secondary charge. rolled insulation doesn\\\\\\\\\\\\\\\\\\\\\\\\\\\\\\\'t require expensive supplies, but the job will use tape, cutters, fasteners and a few other odds and ends. It won\\\\\\\\\\\\\\\\\\\\\\\\\\\\\\\'t make a drastic difference in the bottom line, but keep this in mind. Cost of Labor This is where nearly half of the cost to install rolled insulation (if not more) comes from. Some projects are straight forward and can be completed by one individual. If you have large obstacles or areas the contractors need to work around, it not only extends the hours required to complete the job, but it may require additional workers. Your hired contractor should have a better understanding of what it will cost after performing a walk-through of your home. Types of Insulation Rolled insulation is not a one size fits all option. 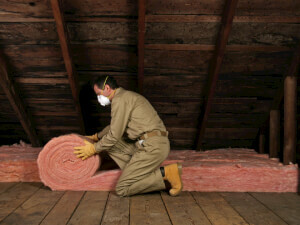 There are a few different grades of insulation to consider. The most common kind of insulation is an R-3 and R-4 roll (three or four inches thick). The thicker the insulation, the better it insulates (typically). Thicker rolls cost more, so this is a price point you need to weigh. While one might cost more upfront, it will help save more money throughout the course of owning the home. There are thinner and thicker rolls of insulation, as well as a few hybrid options. Generally, you don\\\\\\\\\\\\\\\\\\\\\\\\\\\\\\\'t want to go with a thinner form of insulation. Talk it over with your contractor to see what they recommend and what also fits into your budget. Rolled Insulation Cost Breakdown Typically, the average home owner spends around ￡1,156 for rolled insulation. Now, this can drop down to a ￡385 low or jump as high as ￡1,619. If you live in a larger house and require additional man hours based on obstructions in the installation location, the price can increase to nearly ￡2,621 but this is quite rare. Get a Free Local Quote Rolled insulation is rather straight forward, but by understanding the different price points, you should have a better idea of what it is likely going to cost you. Furthermore, if you would prefer a localized quote from contractors in your city, simply enter in your zip code in the space provided. Receive estimates from top professionals. Give it a try, it\\\\\\\\\\\\\\\\\\\\\\\\\\\\\\\'s FREE, and there\\\\\\\\\\\\\\\\\\\\\\\\\\\\\\\'s zero obligation to purchase.